To celebrate Thanksgiving with our friends this year, we hosted a festive Friendsgiving – Thanksgiving cocktail party the weekend before everyone heads out for Thanksgiving, and sipped on pumpkin spice cocktails. It was the perfect way to celebrate, without the pressure of cooking a full turkey and all the fixings. Instead, we decided to play with some traditional Thanksgiving ingredients to make Thanksgiving cocktails and appetizers. We head over to the CUESA Ferry Plaza farmers market most weekends. It’s always fun to see what is fresh and in season. 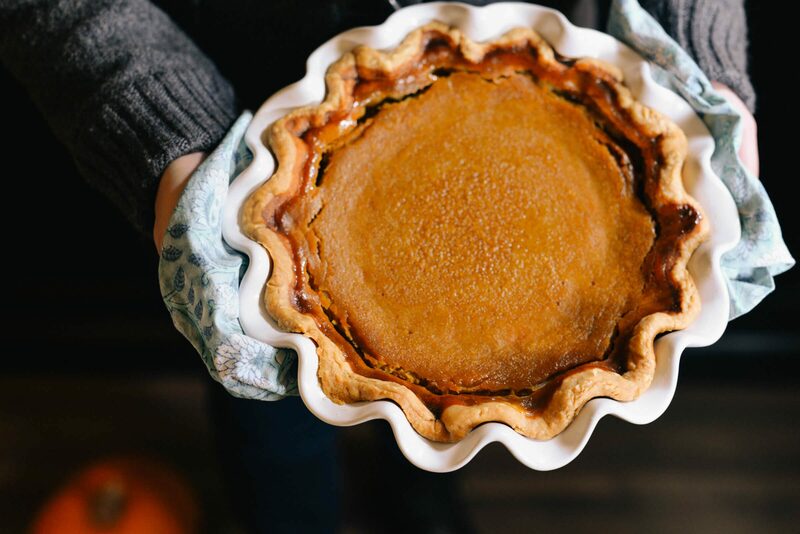 A few weeks ago we picked up these luxury pie pumpkins, which make amazing fresh pumpkin pies, but we decided to try something different and turn ours into fresh pumpkin spice cocktails. We love to use fresh pumpkin whenever possible. It tastes so much better than canned, and it’s easy to make. Just cut the top off of a fresh pumpkin and cut it in half vertically down the center. Scoop out the seeds (save to roast for a snack), and place the pieces cut side down in a sheet pan. Add about 1/4 inch of water to the pan and roast in the oven at 350F degrees for 45 minutes or until it pierces easily with a fork. Scrape out the flesh and either use immediately or freeze. For this cocktail, we pureed the roasted pumpkin with a splash of water in our Vitamix until very smooth. 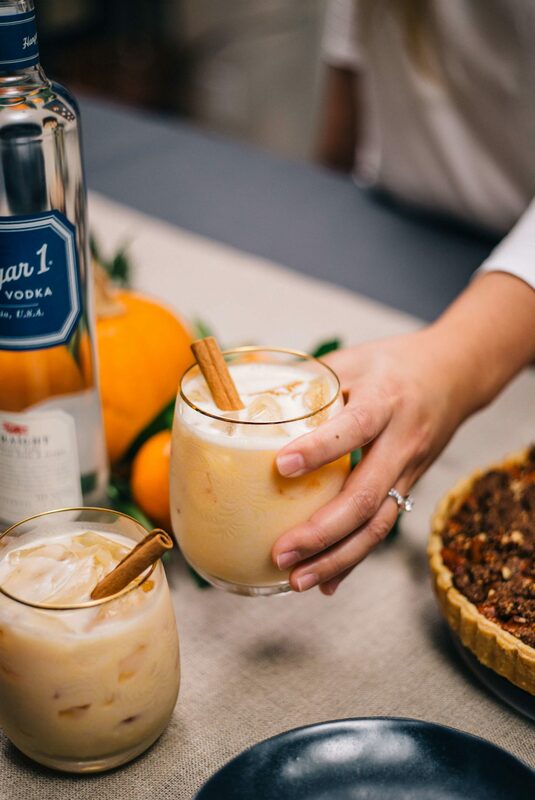 We wanted this Thanksgiving cocktail to be like a fresh pumpkin pie filling in a glass with all of the flavors of the season. An elevated adult pumpkin spice latte. 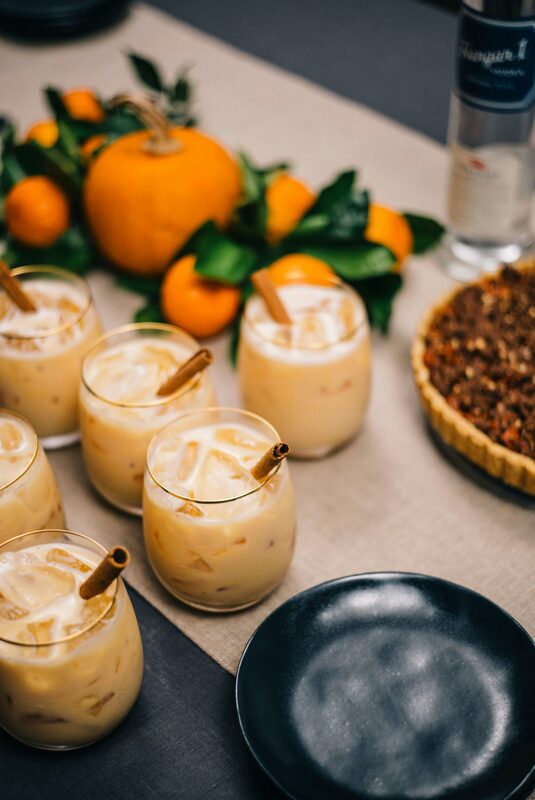 To make our pumpkin spice cocktail, we combined Hangar 1 Straight Vodka, pumpkin puree, Horchata liqueur, ginger liqueur, and bitters in a cocktail shaker, then strained it into a glass filled with ice. We garnished it with a cinnamon stick and served it in these gorgeous gold-rimmed vintage inspired glasses. Hangar 1 has always been a favorite in our house. The distillery is located right across the bay in Alameda in a WWII-era hangar. We love that it’s a local and fresh product, distilled from a mixture of grain and grapes. We’re looking forward to checking it out ourselves, because now you can tour and taste at the distillery. For our Thanksgiving cocktail party, we put out a spread of Thanksgiving appetizers, including our favorite turkey-based albondigas (made and served in this Staub braiser c/o), sweet potato crisps with chive creme fraiche and cranberries (served on this slate board), shaved mushrooms baked with Fontina cheese and thyme, and a fresh persimmon tart. 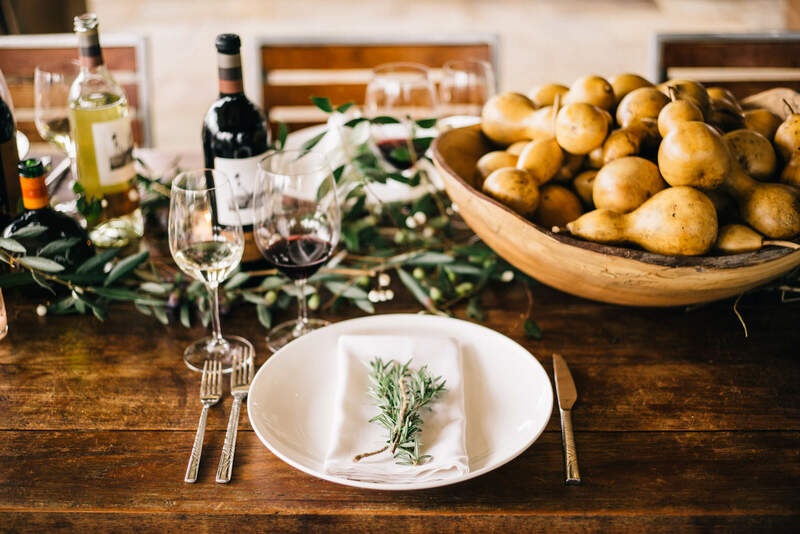 We set the table with a linen tablecloth and natural runner from Crate & Barrel. Everyone had such a fun time snacking on appetizers inspired by traditional Thanksgiving ingredients, and of course the cocktail was amazing. 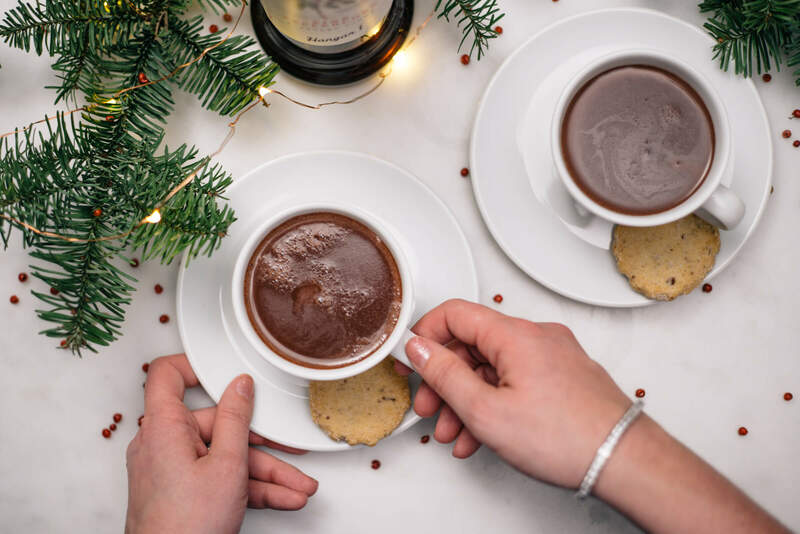 Get the recipe below! Add Hangar 1 Straight vodka, pumpkin puree, horchata liqueur, ginger liqueur, cream, and bitters to a cocktail shaker full of ice. Shake until very cold and well-combined.